Produced by our bees with a little help from us. Besides being local which is a big plus for the health of all Virginians, our honey is antibiotic free, unheated, unprocessed, and contains pollen, some comb & propolis, and live enzymes. 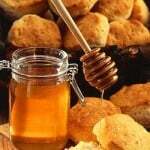 Bee Healthy—Eat Honey!